The Carnival, the only festivity not linked to Catholic liturgy, is deep rooted in the Sardinian culture. Across the island the festivities start with the bonfires of Saint Anthony on 17th January while the main celebrations take place between Ash Thursday and Ash Tuesday to conclude on Ash Wednesday. Interestingly the main carnival characters vary quite strongly from region to region. 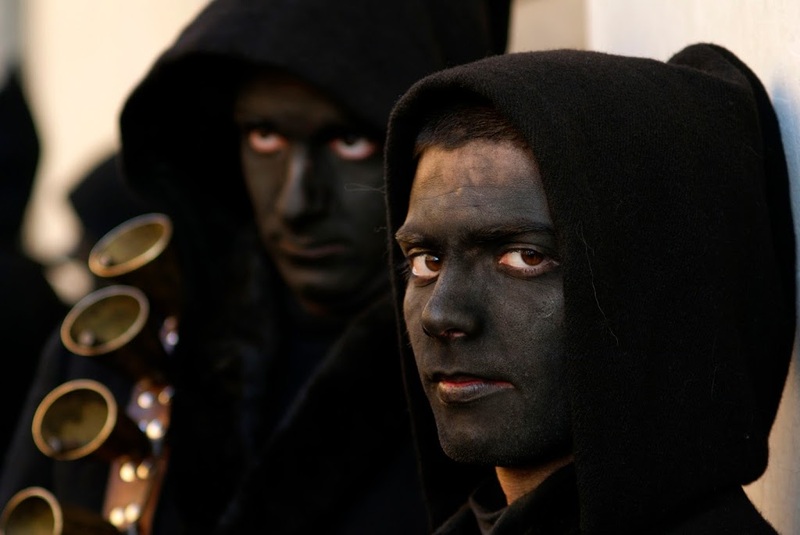 The Carnival often recalls archaic rites, where the year end is represented by a king or queen (in Tempio Pausiania) or by a rag puppet that is tried, condemned to the stake and afterwards mourned with a ridiculous funeral whine (in Bosa, Maimone, Cagliari). 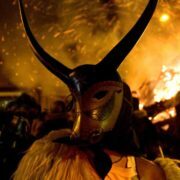 In the center of the island, Carnival often features mute masks of ancient origin such as Mamuthones and Issohadores (Mamoiada), Boes and Merdules (Ottana) and Sos Thuros (Orotelli). Especially in the region of Oristano, equistrian performances are at the heart of the Carnival (e.g. Sartiglia in Oristano, Sa carrela ‘nanti in Santulussurgiu, Sa corsa e sa pudda in Ghilarza). No matter where you decide to go, the Carnival is usually accompanied by beans with bacon, fritters (kind of donuts) and plenty of local wine. Have fun! The celebrations of the New Year have just ended and the next big events are already being prepared. 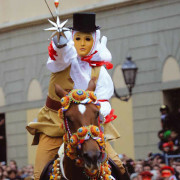 One of the most spectacular happenings in Sardinia during Carnival is the traditional and unique equestrian performance, la Sartiglia, which takes place in Oristano (North West of Sardinia) this year on 11 and 13 February. The main figure of the ride is Su Componidori, a horseman dressed in a fascinating rite and becomes the king of the celebrations. The riders wear a large white embroidered cape with a camellia pinned on, a black top hat and a wooden mask with delicate almost androgynous lines, which give it a magical look. The horsemen gallop through the narrow streets of the town centre and try to spear with their swords a silver star which is hung across their path. At the end of the ride the event continues with daring horseback acrobatics a thigh speed. But the most exciting and spectacular moment of the show is when younger ones ride in the same way taking everybody’s breath away. If you are around Oristano at this time of the year, don’t miss this exceptional experience! 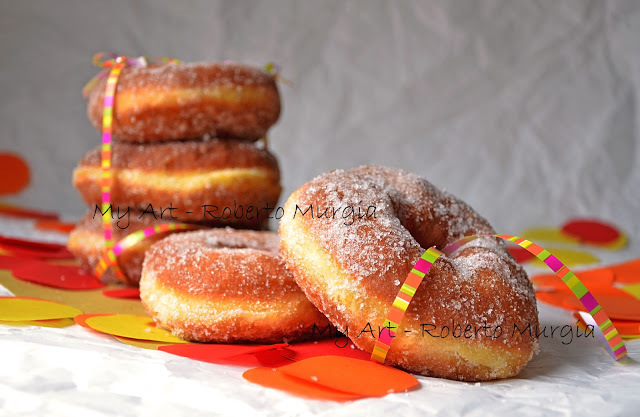 The doughnut-like sweets are called “Para frittus” in Sardinia, which literally means “fried priests”. The origin of their name is unclear, but some say that the hole in the middle of the doughnut recalls the tonsure of the monks, while others claim that the white horizontal line in the middle of the doughnut looks like the cord of the monks’ dress. During the Carnival Para Fritus are served everywhere in Sardinia. Although each region has its own recipe and shape, this specialty always taste great, whether plain or filled. Buon appetito! 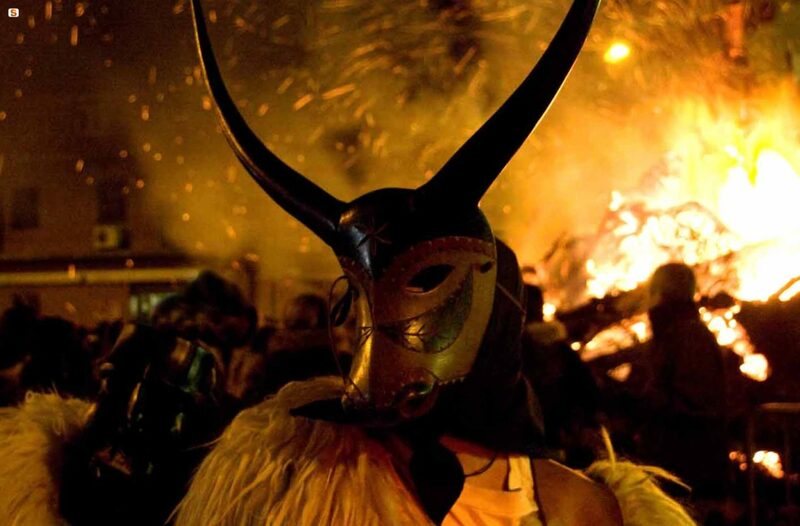 Each year in the night of January 16 many bonfires are lit across whole Sardinia in honor of Saint Anthony, a leading exponent of Egyptian asceticism of the third century AC. Christians see this ancient cult as a devoted opponent of the devils and hell fire. The legend says that St. Anthony stole a glowing spark from the world of the dead to provide mankind with fire. That night, people ask graces and miracles to the Saint in an magical setting dominated by the bonfire consuming huge piles of wood. Mixing Christian devotion and ancient pagan traditions, this rite is documented since the mid-nineteenth century, but its origins are definitely more remote. After the liturgical rites and the blessing of the fire, participants regroup around the bonfire to chat, sing, taste sweets and wine offered by the community. The fire burns all night and the shape of its smoke supposedly predicts good auspices and prophecies. This old ritual also indicates the start of the Carnival.